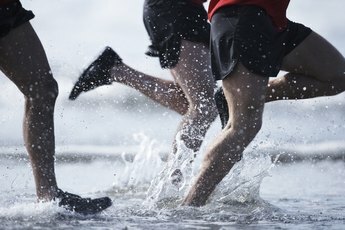 Use ankle crossovers to improve your balance and joint stability. 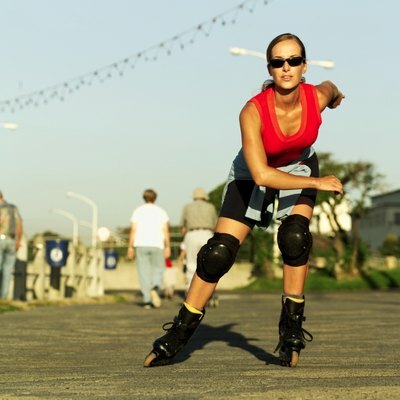 Whether your current love is golf or inline skating, volleyball or parkour, don't underestimate the need for strong ankles. Ankle strength and stability play a key role in keeping you upright, balanced and injury free. Without that stability, you're more likely to lose control when you need it most -- when your center of gravity suddenly shifts. Ankle crossovers with a resistance band challenge the muscles that support your ankles, develop balance skills and offer protection from joint injury. Perform them three or more times a week, and you'll do your core and groin area a big favor, as well. Warm up your hips, inner thighs and ankles in preparation for the exercise. March or jog in place for seven to 10 minutes, or until you break a light sweat. Perform a set of dynamic lower-body stretches -- involving smooth, continuous, repetitive movement -- to further stimulate the muscles needed for a crossover. Lateral lunges are ideal, because they help loosen up the hips, groin and ankles. Leave more intense, sustained static stretches for the end of your workout. 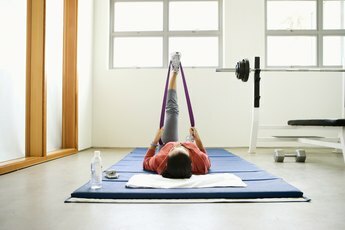 Attach one end of a resistance band to a stationary object, such as a piece of exercise equipment or the leg of a heavy couch. Tie the free end of the band around your right ankle and stand with your feet shoulder-width apart. Your right foot should be closer to the anchored end of the band and staggered slightly in front of the left foot. Bend your knees and ankles just a bit. Inhale and slowly return the right leg to its initial position. Your torso and standing leg should remain perfectly still throughout both phases of the exercise; only your working leg should move. Complete one to three sets of 10 to 15 crossovers on each leg, resting briefly between sets. Switch to your left leg. Follow the exercise with a stretch to prevent soreness and tightening of the groin muscles. Sit on the floor in a butterfly position with your knees bent and the soles of your feet together. Keeping your spine straight, use your elbows to press gently downward on your inner thighs. Hinge forward slightly from your hips until you feel a light stretch along your inner thighs. Hold the position for 15 to 30 seconds and then release the stretch. Repeat two to four times. Begin with a band that offers light to moderate resistance. As you become more adept, increase resistance by standing farther from the anchored end of your band, bumping up to a band with tighter resistance, working with both hands on your hips or standing on an unstable surface, such as a small cushion. Breathe evenly throughout the exercise and keep your movements fluid and controlled. Avoid tensing your jaw, neck or shoulders. Working with poor posture and form can lead to injury, so stay alert. Keep your core -- including your abs, hips and low back -- tight. Retract your shoulder blades, pulling them down and slightly back, and avoid arching the lower back. If you feel your hips shifting or your torso leaning, stop. Check your band for tears and other signs of damage before every use.